“I would love to hear my Lord call me on that Day! ‘Oh Aba Yazid!’ My Lord will call me by my name on that Day – what else can I desire? After hearing Him call out my name, even if He were to hurl me into Hell, it would not matter, I would not fear all the Fires of Hell, just as I would not find happiness even if He gave me all the heavens (in exchange for the ecstasy I am experiencing after having been called by Him). It is such an honour, such sweetness, for me to hear Him call my name! And when He has judged me, and He asks me, what I needed after that, I shall reply, ‘I don’t need anything, this is enough for me from pre-eternity to eternity, to hear the Divine calling my name.’ For Allah, His attributes, His words, are eternal, forever in my ears will I hear His calling of my name, ‘Oh My servant, Oh My servant, Oh My servant, Oh Aba Yazid.’ That is all that I need, I do not desire the Heavens, and I do not fear the Fire, to hear My Lord Almighty calling out my name, when I am indeed nothing……” What Station is this, the Maqam of one who desires only Allah? Oh servants of Allah, be with Allah, then Allah supports you. Habib : We are asking for forgiveness and sincerity. Maulana: Who am I (to grant anything)? Have we no Prophet (saw) (that you are asking this from me)? Will Allah not make Rasulullah (saw) happy (by granting forgiveness and safety to his Ummah)? For sure, Rasulullah (saw) will be sad if he loses even one of his Nation to be thrown into the Fire, so will He throw even one of His servants into Hell? Habib : True, Allah has promised Rasulullah (saw) not to let him down. I am asking sincerity and forgiveness as I feel ashamed towards Allah. Habib: We are asking (knowledge and guidance) from the treasures, Oh Shaykh. Maulana: Rasulullah (saw) had asked Allah, “Grant me this Nation,” and Allah replied, “It is a forgiven Nation, covered in mercy. I have granted you, your Nation, Oh My Beloved Prophet (saw).” We are Ummatun Marhumah, Ummatun Maghfurah. If you had forty children, would you accept if even one of them was taken away by a Sultan? Would that bring comfort to your heart? Maulana: What are we? We are but ants in the eyes of Allah. If an ant commits a mistake, do we get angry and upset with it? Does it burden us? Maulana: It is common knowledge that animals will not be judged. Imagine that you are a farmer. If an animal strays into your field of crops, and he eats from your crops, you would probably complain to the judge about what happened, in order to attain compensation for your losses. Will the judge ask you to bring the animal (eg the cow) to be a witness and to give testimony in his Court? Habib: We are but cattle, Oh Shaykh! This was no ordinary Suhbah. The banter between the two masters was eloquent, poetic and was far too deep for any of us to really understand fully. Maulana mentioned that there are Suhbahs for ants (like us) and for elephants (like our respected Habib Al-Jufri), and ant can never carry the load an elephant carries. Sayyidina Abu Yazid (qs) was asked, “Show me a deed by which I will approach my Lord.” He replied: “Love the friends of Allah in order that they will love you. Love his Saints until they love you. Because Allah looks at the hearts of His Saints and He will see your name engraved in the heart of His Saints and He will forgive you.” For this reason, the Naqshbandi followers have been elevated by their love for their Shaykhs. This love lifts them to a station of continuous pleasure and continuous presence in the heart of their beloved. Though all believers of the Nation of Muhammad (saw) will eventually be safe, even one whose only deed was to recite La ila ha illallah once in his life, there are different categories of Paradises for everyone. A believer who failed to remove his animal-like attributes, will remain in the ‘stables’ – which are Maulana’s term for the lower Paradises below the Throne. Such people lived with animal-like characteristics. As animals, they lived without responsibility, hence they were never given their trusts, for no one gives something of value to an immature or irresponsible one. No father would hand over the family business over to a infant in diapers or to an irresponsible adult. That is why Maulana mentioned so many times in this Suhbah, of the need to build on and constantly improve our conduct, to shed our animal-like traits, and to attain Angel-like attributes. Such ones, and are able to hold responsibility, hence they are the ones who will receive this trust, and may leave this dunia as Khalifas, in order to attain the Station of Rabbani, by virtue of having been brought to the end of this beautiful journey, and raised to completion, by our Shaykh. The Prophet was sent to perfect the akhlaq. The more we can cleanse ourselves of bad characteristics and attributes, the closer to the Divine Presence we approach. All perceived titles and status are meaningless, if one has bad conduct. Though the Prophet (saw) had endless names and titles, no one came to Islam because of the Prophet’s (saw) glorious titles; they came to Islam because they tasted the Love and Truth that he brought into each of their empty lives, transforming them from their dreary existences, into beacons of Hope, intoxicated with Love for the Divine, ecstatic to be on the Journey to eternity, to be with Him, forever! The Prophet (saw) brought a message of mercy and happiness, his conduct touched the very depths of people’s hearts, and even hardened men melted before his humility, gentleness and genuine emanation of mercy. He didn’t just say that he loved his Ummah, he lived it until those around him, tasted it. Even we, who are living almost fifteen centuries later, are still tasting it! Rasulullah (saw) never seared or scalded those around him with derogatory words designed to inflict suffering and humiliation. Never once did he do that, so we must be very careful with what we say to anyone. Shaykh Bahauddeen, Maulana’s son, told me when we met in Kuala Lumpur, “My father has never hurt anyone in his life. He has always told me, to treat everyone’s heart, like a precious glass vessel, which once you shatter, you can never return it to its original state. Accept everyone for what they are, for Allah made them that way. A Saint is one in whose heart, the hearts of many can be united.” What words of powerful wisdom and reality! It is better to receive hurt, then to inflict, as no matter how much you say that you’re sorry afterwards, and try to make up for one dastardly word that you have uttered, you can never piece together a shattered heart! There is a hadees, “To break a believer’s heart, is akin to destroying the Holy Ka’aba,” for the heart of a believer is Arshullah. Treat people with respect. Allah himself showers respect on Mankind. Surely, none of us are more noble than Sayyidina Musa (as), or worse than Fir’aun, yet Allah commanded Sayyidina Musa (as) to advise Fir’aun mildly, so that he may take advice! So there is no reason for any of us to speak to anyone, even unbelievers, in a condescending or harsh manner. You may not agree with someone’s methods/stand/opinions, but we must avoid quarrelling, we must ‘invite all to the way of thy Lord with wisdom and beautiful preaching, and argue with them in ways that are best and most gracious’. That is the Quranic injunction. We must never invent lies and fitna just because we disagree with someone’s opinion. When accusations reach one’s ears, the first thing we are taught in the Quran, is to have a good thought of our Muslim brother (towards whom these accusation are made). Then we are asked to investigate from reliable sources. We must never jump to a sinister of conclusion, and proceed to rip him to pieces on false charges. We must fear Allah, for, as stated in the Verse above, every man among such people will come to grievous punishment. Do not let our hatred for anyone, cloud our judgment of him. Adab, is to be nothing, humble before your Lord. Maulana Shaykh Adnan advised us, to leave all the praise we receive, in the dustbin next to the door on the way out. No matter what praise has been heaped upon us, never leave the majlis carrying such praises. Leave them behind, and leave the majlis as a ‘nothing’, a ‘nobody’, a ‘thing of no status or importance’. Now that is very important, as the aim of tariqah is to become nothing. The reality is that, we are shadows of the Divine, we are capable of nothing if the Divine doesn’t move us. Maulana Shaykh Adnan summarises it in one sentence – we are but shadows of His Divine Attributes, we are nothing. So be humble, harm no one (with word or deed), and strive to shed your animal attributes, so that we too, can experience the ecstasy that our Master Abu Yazid (qs) seeks to taste on Judgement Day. 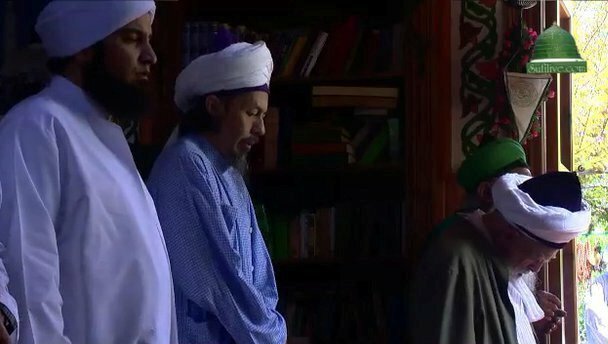 Habib Ali with H.R.H Shaykh Raja Ashman Shah in Lefke with Sultan. This 15 minute Suhbah in Arabic can be viewed only at www.Saltanat.org. Choose from the menu on the right, “Bistami Hz 23.Nov.2010”. There is a CC button next to the Volume control at the bottom of the screen to choose choose subtitles in eleven languages, choose from Arabic, Bahasa Indonesia/Melayu, German, English, Spanish, Italian, Russian, Mandarin, Dutch, Italian and Turkish. Click the AD button at the top right-hand corner of the display area, for a live translation into English. During Live Suhbahs, the buttons at the top provide Live Audio Translations into other languages as well. Should the video no longer be there, please look for it under the video archives of the Saltanat TV site. This entry was posted in Maulana Shaykh Nazim's Suhbahs and tagged Aba Yazid, Abu Yazid, Adab, Al-Jufri, Bayazid, Bistami, conduct, forgiveness, Habib, Judgement Day, Ummatun Maghfurah, Ummatun Marhumah. Bookmark the permalink.